Anyway, my camera came in today! As you can see by a few of the pictures in my post, I’ve been playing with my new “toy” so to speak. As you can see to the left, there’s well… Sadie. She looks so innocent in that picture, unlike Rick! I don’t really know what it is about Rick, but he always has the best facial expressions in photos. I’m not sure what he’s looking at. Who knows? With Rick, it’s always a guess. Someone should come up with captions for these pictures… I had some pictures of Kenny too, but he deleted them before I got a chance to save them. I’ll be using my camera a lot more now, so you can expect to see more pictures in the future. So we had Rick’s birthday party this past Monday, and I hope he enjoyed everything. 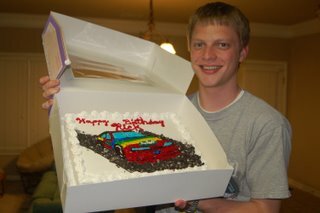 Jeremy had ordered an ice cream cake from Dairy Queen, which he was trying to get them to put Jeff Gordon on the front since Rick likes Nascar, and consequently likes Jeff Gordon as well. However, apparently due to licensing issues they couldn’t actually put the number 24 on the car, but for some strange reason they could still make it look like Jeff Gordon’s car and even put Dupont on the front… like you couldn’t figure out what it was anyway. But here’s to you Rick, I hope you had a happy 19th birthday, enjoy your Seinfield! So today half of my classes got cancelled as well. So I only had Japanese Class from 6-8 today so I got a lot of time to catch up on a lot of projects I missed out from the past two weeks. I also got my hair cut as well, although I’m not sure what to think of it at the moment. It’s really a lot shorter than I normally have it and it just doesn’t look like me at all. But I suppose it’ll grow out again with time. © 2019 Jason Wilson. All Rights Reserved.